The average one-way trip for commuters in the United States in 2017 was 26.9 minutes. Slower traffic helped the data collection programs determine who was looking at the board and for how long. Using anonymous data from mobile devices and apps, (advertisers)have figured out how fast cars are passing by, how much “dwell time” drivers spend paying attention to billboards, what the demographics of the drivers are, and even where they live, travel and shop. The increasingly lengthy commute isn’t just a traffic jam. It’s a captive audience for advertisers. The average one-way trip for commuters in the United States in 2017 was 26.9 minutes, according to the Census Bureau. That was up from 26.6 minutes in 2016 and added two and a half hours to the average time commuting over the course of the year. So even in this age of Facebook, Google, Netflix and Amazon, the companies selling seemingly old-fashioned ad space like billboards have noticed the slowing crawl. Lamar has 175,000 billboards throughout the United States, Mr. Miller said, adding that slower traffic had helped the company’s data collection program determine who was looking at the board and for how long. Using anonymous data from mobile devices and apps, Lamar has figured out how fast cars are passing by, how much “dwell time” drivers spend paying attention to billboards, what the demographics of the drivers are, and even where they live, travel and shop. 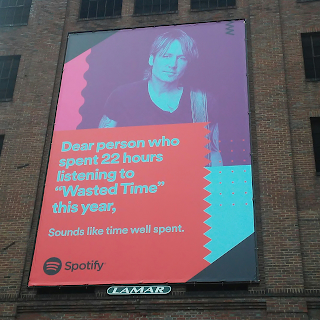 Roughly three years ago, Clear Channel Outdoor started its own data collection service, Radar. Using global positioning data from mobile apps that require mapping — navigation, dating, shopping and restaurant ads — the service blends third-party demographic data with information about people passing billboards to determine not only where commuters will spend, but how. He noted that a recent analysis of fast-food customers in Southern California had found a strong (and perhaps counterintuitive) correlation with their going to the gym, largely because commuting whittled away time for sit-down meals and other forms of exercise. It also showed that billboards for gyms worked better when placed near a commuter’s workplace than near his or her home. Mr. Miller said that data could also help digital billboards, which make up 2 percent of Lamar’s billboard inventory, change to meet an advertiser’s needs at specific times of the day. That could mean a movie studio’s billboard mocking traffic congestion at the height of rush hour, a Dunkin’ billboard changing from coffee in the morning to sandwiches at night, or sequential billboards telling a story. If advertisers can’t catch commuters’ eyes with billboards, they are also trying to reach them through radio. For instance, iHeartMedia — which owns Clear Channel Outdoor — has spent the last three years looking at listener behavior on both its radio stations and its app. Its research has produced data that iHeartMedia now sells to advertisers along with demographic information and specific ad time. However, Robert Pittman, chairman and chief executive officer of iHeartMedia, said commuters were so bombarded with information that advertisers might get them to want a product or service in the moment but not get them to remember once they’re out of their cars. Mr. Pittman said introducing a Taco Bell breakfast menu to commuters when they’re hungry, suggesting they drink Bacardi rum when they get home or pitching a car dealership while they’re stuck in their clunker put those advertisers foremost in a commuter’s mind when they’re most susceptible to persuasion. When 20th Century Fox was preparing to release the Queen biopic “Bohemian Rhapsody” this year, iHeartRadio stations used peak commute times to air interviews about the rock band, Mr. Pittman said. On Nov. 1, a day before the film’s release, different versions of the six-minute title song played across all 650 iHeartRadio stations and sites. Commuters using public transportation are also a coveted audience, especially in cities like New York (where 56 percent of commuters used public transportation in 2017), Boston (35 percent), San Francisco (35 percent), Washington (33 percent) and Chicago (28 percent). Outfront Media is rolling out 50,000 digital video boards at subway and rail stations in New York, the Bay Area, Washington and Boston.